Note: You can use Packet Tracer 5.3.3 to Practice this tutorial. Let’s assume that a Multinational Company has recently opened its branch office in Kabul, Afghanistan and has hired you as their Network Engineer, now they wants you to connect them with their headquarter which is located in the New York, USA. The branch and headquarter are connected by a WAN T1 circuit. Not only that, but they have two more routers in their Kabul branch which have two small Ethernet networks connected in to their LAN sides, so they wants you to connect them to those networks as well, and they want you to do all these using Static and Default Route. Following is the big picture of our scenario. In above Scenario, as you can see that KBL-2 and KBL-3 are our two routers which have a small Ethernet networks connected with them and uses 192.168.1.0/24 and 192.168.2.0/24 networks respectively. 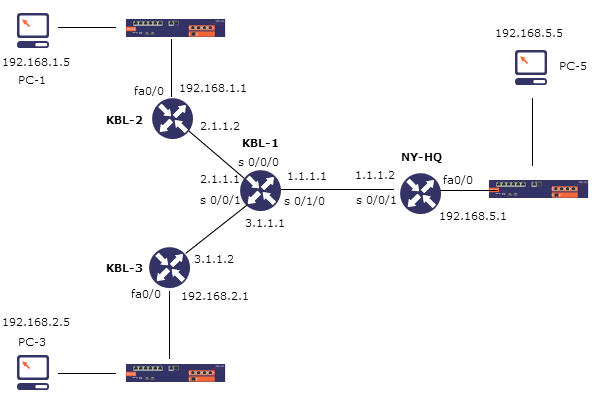 Furthermore both KBL-2 and KBL-3 are connected with KBL-1 using 2.1.1.0/30 and 3.1.1.0/30 networks respectively and KBL-1 is connected with NY-HQ which is our New York Headquarter using 1.1.1.0/30 network. Hopefully I have explained everything well and now it time of configuration. We will start our configuration from KBL-1. KBL-1 is a router which is located in Kabul and is connected with KBL-2, KBL-3 and NY-HQ trough Serial port S 0/0/0, S 0/0/1 and S 0/1/0 using 2.1.1.0/30, 3.1.1.0/30 and 1.1.1.0/30 networks respectively. First we will get into global configuration mode from privileged mode where we will change the name of this router to KBL-1 by using the hostname command. Now from global configuration mode get into serial interfaces, assign them IP and turn their status to UP. Now that interfaces are up, we are ready to configure the static route and by doing this our KBL-1 configuration is finish and our KBL-1 is ready. Our KBL-2 router is connected with KBL-1 trough Serial interface S 0/0/0 using 2.1.1.0/30 network and has a small Ethernet network connected with it trough interface FastEthernet 0/0 using 192.168.1.0/24 network. here is the complete configuration for this router. Our KBL-3 router is connected with KBL-1 trough Serial interface S 0/0/0 using 3.1.1.0/30 network and has a small Ethernet network connected with it trough interface FastEthernet 0/0 using 192.168.2.0/24 network. here is the complete configuration for this router. The NY-HQ router is located in our Headquarter New York, USA which is connected to KBL-1 through Serial interface S0/0/1 and has a Ethernet network connected with it through FastEthernet 0/0 using 1.1.1.0/30 and 192.168.5.0/24 network respectively. With all these configuration, finally our Static route tutorial comes to an end and now that everything is setup PC-1, PC-3 and PC-5 should communicate between each other and to check their communication you can ping them from each other and ping should give 100% replay. if you have any question regarding this Tutorial feel free to ask and comment i will try my best to give you a response as quick as i can. till then my God be with you.